Until recently, that was me. In fact I’d be lying if I said that I wouldn’t seriously consider something chocolate based if you took me out for dinner tomorrow. But as I’ve got older, I’ve started to appreciate other flavours on my plate, subtle sweetness, spice and seasonal ingredients like this simple honey almond cake with strawberries. I appreciate that this is a slightly odd opening given that today’s post is a chocolate dessert. But my argument is that if you’re going to eat chocolate, make it count. Ditch the dry cake or mousse made with too much cream (that leaves your mouth tasting more of fat than chocolate) and indulge in something deeply, deliciously chocolaty. These little pots can be dressed up or down depending on the occasion. Make them with milk chocolate for a party of children, add a little alcohol for grown ups, replace the maple syrup with sugar or leave it out altogether for a truly truffly dark dessert. What’s also exciting about this dessert is the crunchy crumble topping. The original recipe comes from my well thumbed copy of Sara Forte’s Sprouted Kitchen Cookbook where it sits atop a silken tofu lemon cream. I’m not yet convinced about tofu for dessert but loved the idea of sweet crisp oats and a hint of herb. Thyme and chocolate are perfect partners and replacing Sara’s coconut with olive oil creates a marriage of flavours that I’ll definitely make again. In terms of ratio, I like to add a generous dollop of cream and sprinkling of crumble on top of each pot. The custards are rich and the cream and crumble cut through, allowing you to eat just a little more than you probably should. Next time you eat out in a restaurant, consider options other than the chocolaty dessert. After all, if you can make something like this at home, can anywhere else compete? Preheat the oven to 180 degrees C. Line a baking sheet with parchment paper. In a medium bowl, combine the olive oil, maple syrup, vanilla paste and salt. 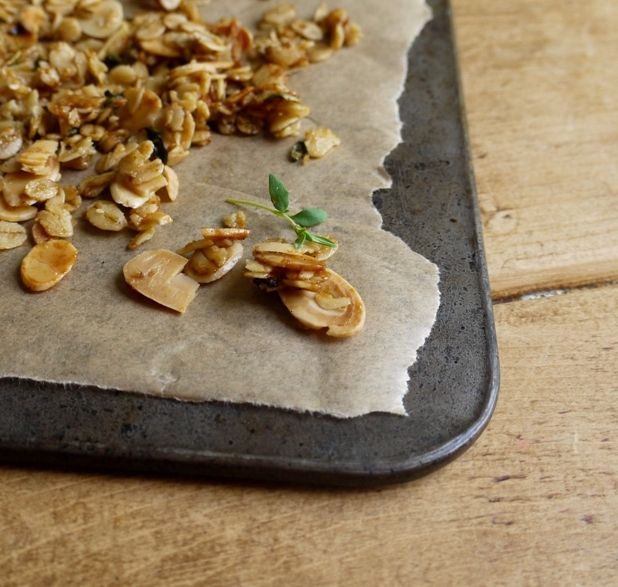 Rub the thyme leaves between your fingers to release the scent then combine with the wet mixture, oats and almonds. Spread on the baking sheet and set aside while you make your chocolate pots. When it comes to baking the crumble, it will take about 20 minutes but keep an eye on it as the ingredients can catch and go from golden to burnt pretty quickly. Place six ramekins in a roasting tin or deep baking dish (mine were on the large side, around 125ml capacity would be ideal so they look generously full). Put the chocolate in a large heatproof bowl. In a medium saucepan, heat the cream, maple syrup and salt until hot to the touch (but not boiling) and the maple syrup has dissolved. Pour the hot cream mixture over your chopped chocolate and whisk until smooth. Set aside to cool slightly. When the chocolate mixture is tepid, whisk in the eggs and vanilla. If it looks at all grainy, blitz the mixture in a blender or whisk well until completely smooth. Divide the mixture between the six ramekins. Fill the baking dish with warm water so that it reaches about half way up the sides of the ramekins. Cover the whole thing with tin foil and bake for 30 – 35 minutes until the outside of each custard is set but there’s still a little wobble in the middle. Remove the custards carefully from the water bath and allow to cool on a wire rack. Whip the cream until soft peaks form then fold in the vanilla seeds. Place a dollop of cream on each chocolate pot and scatter with the crumble. Decorate with a few thyme leaves, if you like. The pots are best served at room temperature. If you’re not going to eat them straight away, refrigerate then take them out about 15 minutes before you want to eat, adding the cream and crumble at the last minute. These look and sound quite special. Like you, my tastes have evolved, and I now much prefer savoury over sweet. But a small ramekin of this would be a lovely treat. I have Sara’s book but haven’t really explored explored it (bad Amazon habit!). I think I need to find time to do so. Thanks for these recipes. This sounds wonderfully decadent. The topping sounds wonderful. I’m planning a supper party for friends on Friday and I think this will now be my dessert option. Thank you! This looks fantastic! However, if there’s is no lemon tart on the menu, dessert is always something chocolaty! Oh my goodness. That looks delicious! It’s morning where I am, so I’ve only just had breakfast – not the best time of day to be getting a chocolate craving 😉 haha. I honestly haven’t eaten out in so long, I’ve forgotten what I usually get for dessert, but anything with caramel or maple syrup is usually a winner for me! Georgia: You’re not alone, my chocolate cravings mean I quite often eat Milk Chocolate Alpen Bars if I need an on-the-go breakfast – they contain more cereal than chocolate, but boy does that chocolate make a difference and set me up for the day. Ah, thank you! I’m so happy to be a part of the start of your week! Gorgeous! I love the photos, and the idea of this combination is mouthwatering. I totally agree on making chocolate count. I always go for fruit-based desserts rather than chocolate, but every now and again I eat something that reminds me how good chocolate can be – this looks like one of those things! By the way, I love the photos on this post. Have you been experimenting with your photography style? 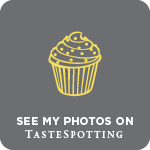 Thanks Jennifer, that means a lot to me coming from someone who takes such fabulous food photos! I took these pics quite late in the afternoon (loving the long British summer days) and dragged our kitchen table over to the window to make the most of the light…so glad it worked! If there’s one thing I bloody love, it’s a chocolate pots. With maple? Amaze. I can imagine the crumble would be wonderful on these little pots or maybe even on some ice cream! Wow those chocolate pots look absolutely decadent and I love the sound of the thyme crumble on top! These little pots look delicious! I’m not a dessert person, in fact I usually opt for cheese but I would give these a go in heartbeat. Chocolate is something I wished I was addicted too, I’m just not that very fond of it. And that coming from a Belgian girl,… maybe that is why! Oh this sounds so lovely! I really like the chocolate and maple combination and when you throw in some of my other favourites (olive oil! thyme! ), I’m completely sold. Nice! I really prefer chocolate, but like you said — restaurant chocolate options can really besmirch the good name of chocolate! Something intense like this is much better. I love the crumble. It’s an unusual combination of flavours that I haven’t seen before. I look forward to trying this. In the past I have always opted for the chocolate dessert but I now try other dishes. I love anything with nuts in it. These chocolate pots look absolutely delicious! I love the look of the topping! I never thought of thyme and chocolate, but savory crumbles are very in right now and this sounds fab! Thanks for sharing! maple and chocolate and crumble are some of my favourite things! looks utterly delicious. I remember seeing this thyme oat crumble in the sprouted kitchen cookbook. I’m actually really intrigued by the whole silken lemon tofu creme bit, and I kinda want to try it out on my more hippie-ish, experimental sister. 😀 It is nice to know it pairs well here, though, and nice job of adapting it into something so delicious. I love that there is a HINT of chocolate in these, but so many other great flavors. 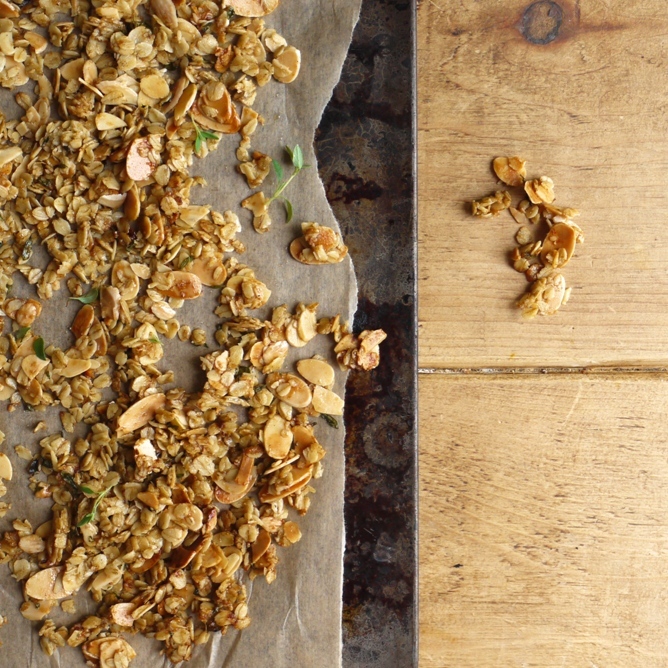 The thyme crumble makes me especially happy…I love herbs in my sweets! Herbs in sweets are totally underrated, I love them! Is this dessert amazing or what?! Love everything in this recipe Kate! I usually want a few tablespoons of a chocolate dessert only if it´s very dark chocolate in flavor. Otherwise I want something unusual or no dessert at all. I love herbs and chocolate together. I don’t always go for chocolate, but when I do, I tend to like it rich and deep, like this. I think I need this combination in my life! Oooh I love this idea. Thyme works so well with chocolate too. This is going on the weekend list! 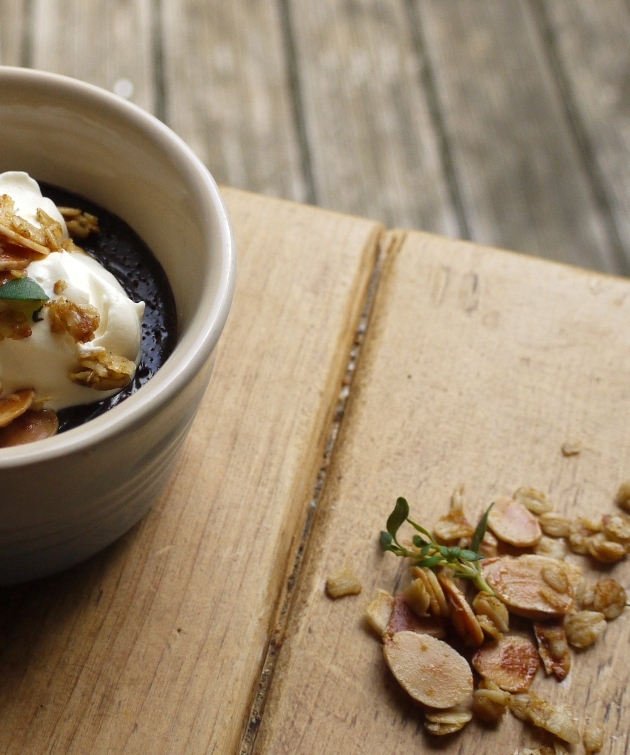 Love the look of these chocolate pots and the thyme crumble is a great idea. Delicious! Desserts have to come in the form of chocolate, especially when in a restaurant? Uhm yes, that would be me! 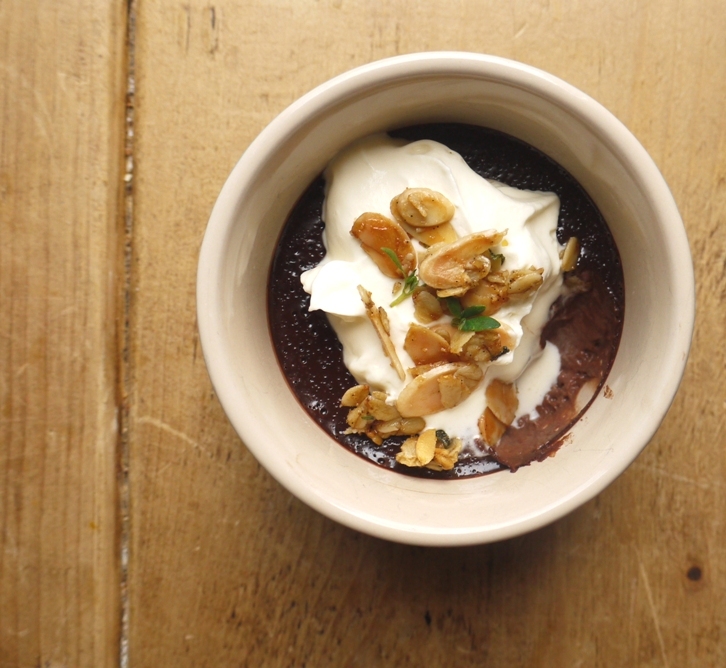 I love chocolate pots – such a good pud to make en masse, in advance. 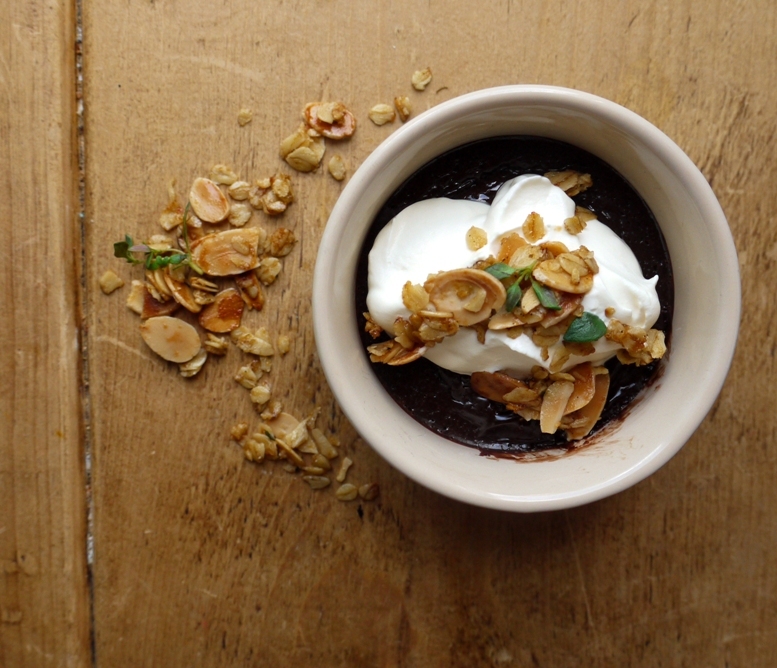 But always looking for a twist on the classic choccy pud, so this is a definite one to add to my ‘to do’ list….